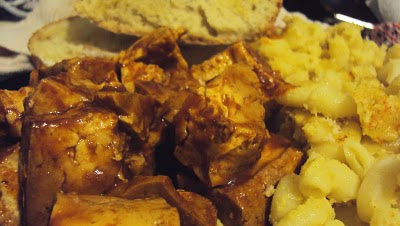 The barbecue tofu is not prepared as a meat substitute, meaning that it doesn't try to look or taste like meat, which might scare off fellow omnivores, but meat doesn't always have to be the main course of a meal and vegan dishes don't always have to include mock meats; and I'm perfectly fine with that. The tofu is nice and thick with a barbecue flavoring; it also fills you up, which is a problem I find with some Vegan meals. I'm not a food connoisseur, so all I can say is that it tastes great and if you enjoy tofu you'll like it; and if you're not a sheltered eater you should take a chance on GOOD vegan food. The side dish is vegan macaroni and cheese. Obviously it's not real cheese. It's different from your boxed macaroni and cheese; it's not as runny or thin. 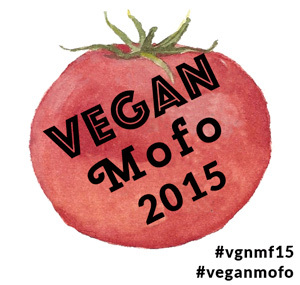 If you ever eaten home made macaroni and cheese then you'll love the Vegan version. Layer cubed tofu and BBQ sauce in slow cooker. Cook on low for 4-5 hours! The mac & cheeze is courtesy of the old recipe found on Get Sconed! which seems to be removed! I hope it is posted again - it is tasty!